If you have ever used a large hole-saw in a drill you know the dangers that can happen if the saw binds into the wood. The drill will either twist right out of your hand, or your wrist will end up twisting right along with it. To prevent this from happening, Bosch's new DDH181X Drill and HDH181X Hammer Drill use something called Active Response Technology. Using an integrated acceleration sensor, Active Response Technology is able to detect sudden movements caused by binding and is able to cut off the power to the motor before it gets out of control. This feature adds safety and peace of mind to high-torque drilling tasks. The Bosch DDH181X and HDH181X both boast high torque specifications at 700in.-lbs. and 750in.-lbs. respectively, so it is nice to see that Bosch is doing something to make these powerful tools safer to handle. In case you were worried about durability, both drills have been given the Bosch Brute Tough moniker and have been built with Bosch's Durashield housing and feature an all metal gearbox. Bosch's says the drills are capable of surviving 20 drops from 3 meters (9.8-feet) onto solid concrete. 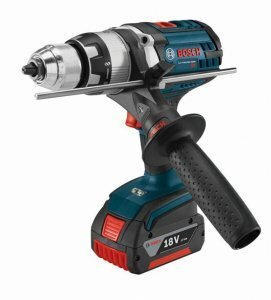 The Bosch 18V DDH181X Drill Driver retails for a suggested price of $279, while the Bosch 18V HDH181X Hammer Drill Driver retails for a suggested price of $299. Both 18V drivers will be offered in a kit with two 4.0 Ah FatPack batteries and charger, and will be available in May 2014 at authorized dealers nationwide.